After more than a decade of near daily use, I still love my Steelcase Think chair. Today is cleaning day at CAHQ (Camden Associates Headquarters). That means dusting/cleaning the furniture, as well as moving piles of papers from one part of the office to another. As part of the gyrations, we flipped my trusty Steelcase Think upside down, and saw that its date of manufacture was Feb. 15, 2005. Wow. The chair is in excellent condition. The only wear is that one of the rubber armrest pads cracked and was starting to peel apart. We superglued it back together; it’s super ugly but should last for another decade. 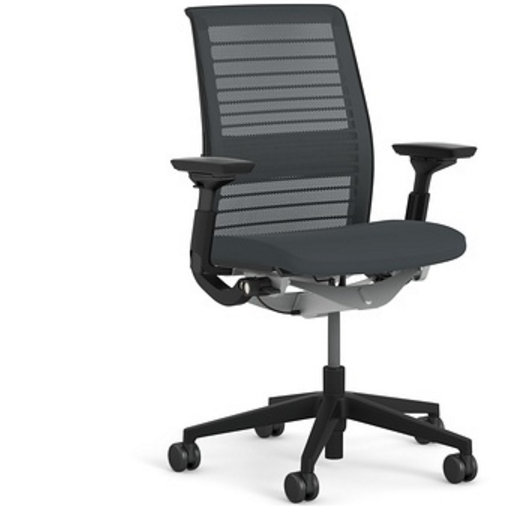 Looking at the Steelcase site, the Think chair has changed only a little bit since mine was purchased. My chair has a black mesh back (they call it “3D knit”), black cushion seat, black frame, and black wheel base. You can still buy that combination. However, there are now new options, like different types of wheels for carpet or hard floors, a tall bar-stool-height base and even an integrated coat hanger. There are also lots more colors and materials. Oh, and the price has gone up: My particular chair configuration would cost $829 now. What I particularly like is that there are very few settings or switches. It’s so simple, and I don’t need to keep fiddling with it.